David Joel Stern (born September 22, 1942) is the former commissioner of the National Basketball Association. He started with the Association in 1966 as an outside counsel, joined the NBA in 1978 as General Counsel, and became the league's Executive Vice President in 1980. He became Commissioner in 1984, succeeding Larry O'Brien. He is credited with increasing the popularity of the NBA in the 1990s and 2000s. On October 25, 2012, Stern announced that he would step down as NBA commissioner on February 1, 2014, 30 years to the day after beginning his tenure as commissioner. His deputy, Adam Silver, is his successor. On February 14, 2014, the Naismith Memorial Basketball Hall of Fame announced that Stern would be a member of its 2014 induction class. In 2016, he became a member of the FIBA Hall of Fame. On February 1, 1984, Stern became the Commissioner of the NBA, succeeding Larry O'Brien. It was during that same year (1984–85) that four of the league's marquee players during the 1980s and 1990s—Hakeem Olajuwon, Michael Jordan, Charles Barkley, and John Stockton—entered the NBA. Stern has been at the center of multiple controversies during his time as commissioner, with a noticeably more frequent trend in recent years. He is married to Dianne Bock Stern, and they have two adult sons. They reside in Scarsdale, New York. ↑ "David Stern Celebrity". TV Guide. Retrieved November 24, 2014. ↑ "From Corned Beef To Caviar". Sports Illustrated. June 3, 1991. ↑ David J. Stern, National Basketball Association. Retrieved September 3, 2007. ↑ "David Stern has date for retirement". ESPN.com. ESPN. 25 October 2012. Retrieved 25 October 2012. ↑ Halberstam, David (1999). Playing for Keeps: Michael Jordan and the World He Made. Random House. p. 120. ISBN 0-7679-0444-3. ↑ Burns, Marty (2002-05-07). "In terms of dollars, Jordan was NBA's real MVP". Sports Illustrated. Retrieved 2007-07-20. ↑ DuPree, David. "NBA Finals are whole new world", USA Today, June 14, 2005. Retrieved September 3, 2007. 1 2 "David J. Stern". NBA.com. 2007-11-09. Retrieved 2011-01-10. ↑ Mahoney, Brian (May 18, 2009). "Griffin the big gift at lottery's 25th anniversary". USA Today. Retrieved May 20, 2010. ↑ McManis, Sam (May 14, 1985). "NBA's New Showtime: It's Called the Lottery". Los Angeles Times. Retrieved May 20, 2010. ↑ "ESPN.com - 2002 NBA Draft: NBA out to prove conspiracy theorists wrong". Sports.espn.go.com. Retrieved 2012-10-26. ↑ ESPN.com - GEN - Joe Smith was worth all this trouble? ↑ "Stern: T'wolves put franchise at risk". CNN. ↑ "NBA dress code upsets black stars". BBC News. October 31, 2005. ↑ Mahoney, Brian (October 31, 2006). "Study: New NBA ball performs differently". USA Today. ↑ Robbins, Liz (December 6, 2006). "A Whole New Game Ball? N.B.A. Admits Its Mistake". The New York Times. ↑ Roscoe, nance. "NBA to ditch new ball, return to old", USA Today, December 11, 2006. Retrieved September 3, 2007. ↑ Thiel, Art (April 20, 2008). "Stern and Bennett: Scoundrels must be held accountable". Seattle Post-Intelligencer. ↑ Wojnarowski, Adrian (2011-03-21). "NBA players' union leader takes bold stand — NBA — Yahoo! Sports". Sports.yahoo.com. Retrieved 2012-10-26. ↑ "Los Angeles Lakers deal to acquire Chris Paul off — ESPN Los Angeles". Espn.go.com. 2011-12-09. Retrieved 2012-10-26. ↑ Wojnarowski, Adrian (2011-12-09). "Teams still pushing for Paul trade — NBA — Yahoo! Sports". Sports.yahoo.com. Retrieved 2012-10-26. ↑ Berger, Ken (2011-12-09). "Nixed Paul deal makes NBA look like second-rate bush league — NBA — CBSSports.com News, Scores, Stats, Fantasy Advice". Cbssports.com. Retrieved 2012-10-26. 1 2 "Bill Simmons laments how far the NBA has fallen in the wake of the Chris Paul situation". Grantland. 2011-12-08. Retrieved 2012-10-26. 1 2 "Phil Jackson predicted Chris Paul trade issues a year ago — ESPN Los Angeles". Espn.go.com. 2011-12-14. Retrieved 2012-10-26. ↑ "David Stern and NBA owners look vindictive and petty in veto of Chris Paul trade — ESPN". Espn.go.com. 2011-12-09. Retrieved 2012-10-26. ↑ David Stern: Sanctions coming. ESPN, 2012-11-30. ↑ Spurs fined $250,000 for 'disservice'. ESPN, 2012-11-30. 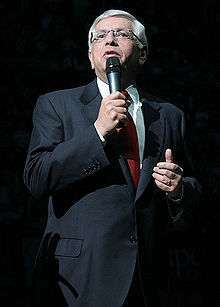 1 2 "David Stern stumbles again in his failed culture war against the Spurs, fines franchise $250K". Yahoo! Sports. 30 November 2012.